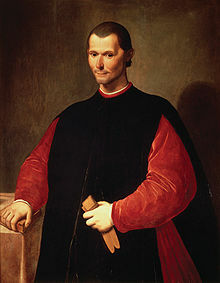 Niccolo Machiavelli (1469-1527), Florentine diplomat and 'father of modern political theory', experienced life amongst the political courts of Europe and witnessed firsthand the acts of powerful men. Though a staunch Republican, his infamous work The Prince advises an autocratic ruler on how best to govern, modelled largely on the ruthless yet successful Cesare Borgia. Machiavelli's work was among the first to take a candid view of politics, placing ethics to one side. The following is a personality profile of Niccolo Machiavelli based on his work. Niccolo Machiavelli is unconventional and shrewd. He is intermittent, he has a hard time sticking with difficult tasks for a long period of time. He is unstructured as well: he does not make a lot of time for organization in his daily life. But, Niccolo Machiavelli is also unconcerned with art: he is less concerned with artistic or creative activities than most people who participated in our surveys. He is also relatively unconcerned with taking pleasure in life: he prefers activities with a purpose greater than just personal enjoyment. Considers helping others to guide a large part of what he does: he thinks it is important to take care of the people around him.